Always keep a good blackmail ready for when you will need it. That’s why she’s chief of security. She can secure anything. A good head of security is like a confidence man and master chess player. Did these photographs come up earlier in the story? I can’t recall anything like them but we’re pretty deep into it and it’s been a while. Emily got pics of King having, uh, ‘relations’ with a cherry-lime JELLO mold? Where is the blueish glass shelf in the first frame? Under Anesu’s knee, only partially in view… The first and second frames are from slightly different viewing angles. The “camera” takes a good step back and somewhat to the left between those frames. While this is correct and an astute observation, Vincent G’s original puzzlement still stands, I think. 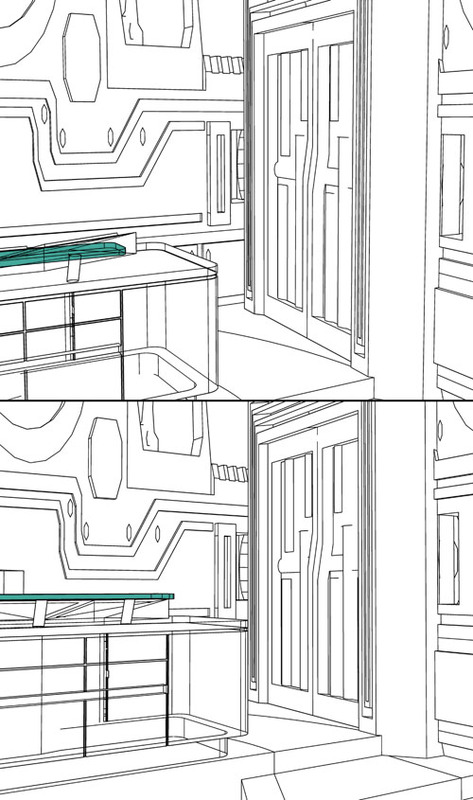 Normally Chris’ 3D assisted perspective angles are flawless but unless I’m missing something here they do not seem quite right between frame 1 and 2 – it looks like it is mostly a zoom out rather than a camera shift (judging from the table angles). So Emily should not move as much (well, she might have), the glass shelf certainly should not translate by this much, and it is also difficult to see the background hallway matching up. This slightly marrs what would otherwise be choice camerawork and suspense-inducing pacing by the visual director that throws the viewer into the middle of things and keeps them on their toes through frantic camera-turns. But upon closer inspection of the first frame, I now see a little corner of blueish shelf I had not noticed before. Of all the times to be away from my computer! I can post my reference shots, but not until I get back on the 8th or so. Remind me and I will! well, you all are right. In the second panel I drew Anesu too far to the left from the edge of the desk. Below are my references for the first two panels. Thanks for clearing that up. The images are most impressive! I think the slight inaccuracies – which only a few gifted/cursed people like Vincent and myself are likely going to notice – likely arise from repeatedly drawing 2D characters in similar poses while slightly changing 3D perspective. There’s also the missing exterior faces in the 3D ship model used in “One Way”. The first instance is on this page. Third panel, on the intersecting circular window frames. Outside view should look like the inside view in the last panel. Is it just me or do King’s teeth look pointier when he’s yelling? I’m so disappointed with King. It sounds like he really hit rock bottom after losing Oola. I don’t recognize this broken shell of a mirrghroot any more. He’s become pathetic, reactive, completely without initiative or imagination. A leader so crippled cannot remain in possession of his domain for long; a more-imaginative, less-depressed leader will rise in his place. And the first thing that new leader will do is take out Emily with no warning. Since she’s the real power behind the throne and head of security, she’s the one real obstacle. I haven’t discounted that the entire conspiracy has been set up as a distraction to allow an assassin a shot at Emily. It still could work, with unpredictable repercussions. Don’t worry! POTTYBOT will show up in the nick of time to take a lasershot for her!